Welcome to this week's Finance Fridays. Last week we were looking at what happens to your pension when your company goes bust. This week we are getting the confetti out and talking about the cost of weddings. Now we are in May the summer wedding season has begun in earnest. 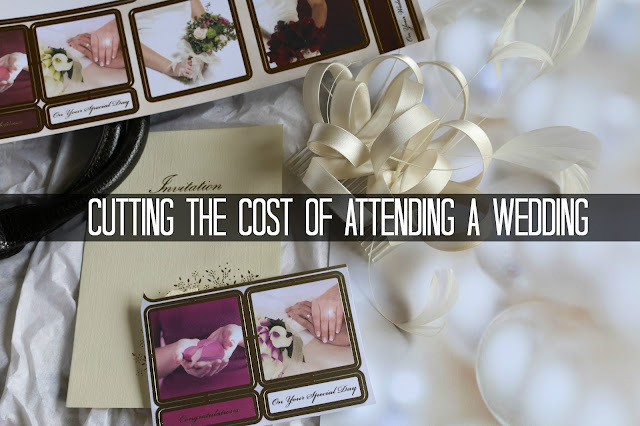 Invitations have started to arrive and with it the cost of attending a wedding. Research has found that the average amount a person spends on going to a wedding is between £300 and £400 each. For a single day out this is quite an outlay so let's have a look how to cut that spend down. Don't go – It may seem quite harsh but receiving an invitation doesn't mean you are forced to attend. If you haven't seen or spoken to the person in years, they are part of your very extended family or live hundred of miles away then just say no. To be considerate make sure you reply quickly so the couple have plenty of time to confirm final numbers. Wear it again – I know for most us we love the thought of a whole new outfit but if you're a woman a new dress, shoes, hat and handbag will set you back quite a bit. If you already have a suitable outfit and you know none of the guests will have seen it before then wear it again. You could also do a bit of mix and match by swapping round different jackets and scarves. For a man if you already have a suit a different shirt and tie can make it look like a different outfit at a fraction of the cost of buying a complete new suit. Go home – If the wedding is local to you don't stay in a hotel on the night of the wedding. A pre-booked cab at 11pm will always be cheaper than the cost of one night in a hotel. Hold back on the alcohol – After the main reception meal you will usually have to pay for any more drinks yourselves. At such venues the price of drinks is hiked up for the captive audience so hold back on the booze. Without looking too mean try not to be flash by buying large rounds of drink or over indulging yourself. Your head, liver and kidneys will thank you in the morning along with your bank balance. Gift list – If the bride and groom have picked out a gift list get onto it quick before the cheaper presents are bought. If you leave it until a couple of days before the wedding you'll be left with the 55in TV or surround sound system. If they ask for cash give what you want to give not what they expect you to give. Weddings should be about celebrating a couple's commitment to each year not as way to pay for an expensive honeymoon. Alternatively you can risk going off list and just buying something you want to give them. Have you been invited to any weddings recently? Have you put off going due to the cost? If you want to join in with this week's Finance Fridays then add your link to the linky below. Any post concerning financial matters is allowed. Full details here. It doesn't have to be published today as you have until 23.55 on Tuesday 24th May 2016 to join in. I have never looked at weddings as being expensive. We pretty much cut our cloth and we not over extend to please anyone! I always wear the same wedding outfit but find travel and accommodation really add up! Well we eloped to Vegas with two friends and spent less than £3k so I think we did really well! Not attended many weddings to be honest, but I certainly know we wouldn't spend above our means to attend! Great tips for people who have several weddings to attend. I often have worn the same outfit if I thought I could get away with it. We definitely wouldn't spend anywhere near that on a wedding - that's silly money for one day isn't it?